It was a day where youthful talent dominated at Edgbaston. 21-year-old Zak Crawley impressed with the bat, scoring his second first class century, and 19-year-old Henry Brookes impressed with the ball. 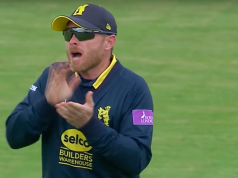 Even though he only picked up the one wicket he looked to be the best of Warwickshire’s bowlers, with some quick pace and his sharp action troubling some batsmen. The opening session for Warwickshire did not go as hoped. Kent made a solid start, surviving the first hour without the loss of a wicket, with openers Sean Dickson and Zak Crawley being 50-0 off 16 overs. This partnership of 82 was then broken, however, by Ryan Sidebottom who took the first scalp of Warwickshire’s season, getting Dickson to edge to Liam Banks at gully. There was some misfortune for the returning Henry Brookes, when he managed to get an edge off Crawley on 46, but the ball was put down by Dom Sibley at second slip. Although there was some dispute as to whether the ball carried or not, this drop would prove to be costly. Crawley would go onto to make a century later in the day. 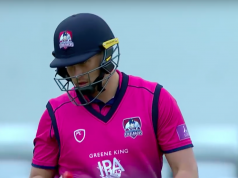 Kent’s overseas player Matt Renshaw came to the crease and this pair continued to excel. They both looked very settled heading towards a large partnership but Craig Miles, on his Warwickshire debut after moving from Gloucestershire, broke the 87 run partnership by getting an edge through to keeper, Tim Ambrose for 34. Throughout the first two sessions of the day, and amongst the two other wickets falling, opener Crawley kept his composure and took advantage of the glorious sunshine basking over Edgbaston, bringing up his century up off 165 balls. This was the 21 year old’s second hundred of his career. He made his first in the backend of last season after a run of being dismissed in the nineties, so it must have been something of a relief to get into triple figures. Daniel Bell-Drummond was the next man to fall for Kent. He edged behind to Ambrose, as he struggled to play Brookes’ rapid bowling. He was not convinced that he had hit the ball, but Warwickshire seemed certain in their appeal and the finger went up. Then came the departure of the centurion Crawley, as he lost his wicket to the quality spin bowling of Jeetan Patel for 108, leaving Kent on 209-4. He had played very well throughout the morning, and played strongly for his duration of the afternoon session, but when Brookes and Patel were bowling in tandem he seemed to look a little less settled, and eventually edged behind to Ambrose. In the final session of the day, Heino Kuhn and Ollie Robinson put Kent firmly on top. They batted superbly together to make a partnership of 119 for the visitors. The latter of the pair scored his first half-century of his first class career, passing the 50 mark from 82 balls and having played a high quality innings with Kuhn. The hosts struggled to threaten the partnership and the pair at the crease guided Kent over 300 and to their fourth batting point. The partnership was brought to a halt by some brilliant bowling by the debutant Miles, as he trapped the resilient Kuhn LBW for 72 off 97 balls, with Kent on 323-5. It was now the turn of veteran, Darren Stevens to support the young Robinson in steering Kent to the end of day one. Although he proved lucky, as Sibley dropped another catch at second slip – and this one was definitely carrying! Kent finished the day on 367-5 and had seemed to dominate for the duration of the day. Crawley’s 108 was a stand out performance for the visitors and they took full advantage of the Birmingham sunshine shining down on Edgbaston. 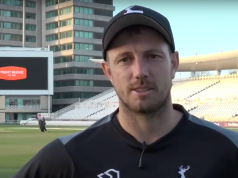 Warwickshire will take some positives from the day with Brookes, the ‘’potential superstar’’ showing that amazing potential with some pace bowling that seemed to unsettle Kent for a short while, and with Miles showing promise on his first outing in a Warwickshire shirt.